Technological advances in glass making now allow large and strong glass extensions to be built, as anyone who watches property and design television programmes will already know. 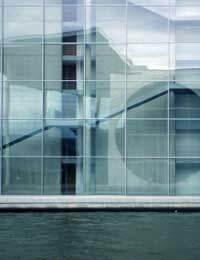 What are the constraints in building with glass acting as a structural component and what can be done with it? The term structural glazing should really only be applied to constructions where the glass is playing a role in supporting the building, or itself. But increasingly in the consumer press it is being applied to any extension or building project where there is extensive use of large sheets of glass. Structural glazing can also be used to create beams of glass, though these are at the moment uncommon and expensive. Most structural glazing systems are owned by individual manufacturers so you have to decide which system will work for you; you can't mix and match. They usually feature proprietary linkages, often made from stainless steel, at the edges and corners. These hold the sheets of glass together, using a sealing strip or liquid sealant which solidifies, to weatherproof the joints. Some systems use glue rather than brackets to hold the sheets together. A conservatory or garden room can be spectacular if it is made with large panes of glass instead of the more conventional framed conservatory structure. The frameless glass gives an uninterrupted view and for that reason it is popular in properties where there is a landscape worth investing in. Structural glazing can also be useful for linking buildings together with light and airy, but warm and dry, walkways. Although more often associated with contemporary buildings and design, structural glazing has been used to great effect with older properties. In many cases planners are now asking for extensions to historic buildings to be made of materials that are different to, but complement, the existing structure. This is instead of using identical older materials and trying to make the new extension look original, the idea these days is that the new additions should be obvious to the viewer. Structural glazing fits well with that objective and also allows the older fabric to be clearly seen through it. In particular when adding to the side or rear of a building glass can create a simple and elegant structure that allows the original building, the glass extension and the garden to co-exist effectively. Every glass extension will be a custom build and that means finding experts who have used the materials before. It's worth getting three or four companies round to discuss what you want as there are different characteristics of every structural glazing system. You may find that one you like the look of but it won't be able to cover the spans or make the shapes that you need. The glass sheets are often made to size for each project which adds to the cost, making it a lot higher than conventional building methods. Structural glazing is undeniably expensive. Building costs, where companies will commit themselves, are in the order of double the amount per square metre as average building costs with traditional materials. That of course raises the question of what can be considered an average building cost, as it varies according to region, materials, the type of project and the type of property you are extending. But it would be wise to prepare yourself for a shock. Building an extension with structural glazing is not for the faint hearted. It will be time-consuming finding the right glass, structural system, designer and builder and to top all that off it will cost an arm and a leg. But if you can afford it, you could end up with a really dramatic extension to your property.